This compact deciduous shrub has magnificent foliage. 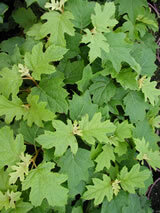 The oakleaf shaped leaves emerge from woolly shoots a rich green in spring. 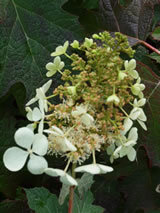 Magnificent pyramidal 20 cm long clusters of creamy-white flowers in the summer months. The leaves in autumn turn burgundy, red and wine-purple, staying on the plant until the plant until the new leaves emerge in spring. Prefers semi-shade and good soil that does not get too dry. Prefers a semi-shaded site / Will tolerate very hard frosts.